Super quick, easy & yummy! Pasta with Roasted Red Pepper Cashew + Sage Sauce and Broccoli Rabe… because this is how we get our veggies when it snows in April. Seriously though, I thought I’d be kicking off April with a Veggie Buddha Bowl or loaded salad, but today’s sizable snow had us craving comfort food. 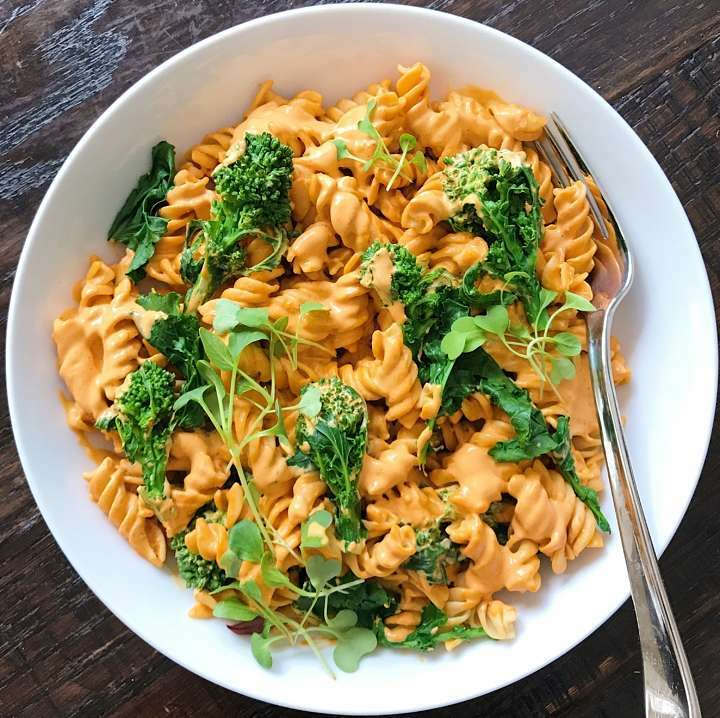 So I tried this Roasted Red Pepper Cashew Pasta from @sammyyeason, recipe posted on FeedFeed Vegan, and added in some broccoli rabe because I was craving some greens, and like the bitter and earthy taste of broccoli rabe once in a while. (It would also be great with broccolini or broccoli if you want greens or mushrooms if you’re looking for another vegetable). It couldn’t be easier, quicker or yummier! I literally whipped up the sauce in a Vitamix and steamed the broccoli rabe while the pasta cooked. Mixed it all together and topped with micro greens! The sauce is super creamy (and dairy free) and makes enough that we have extra for a second box of pasta. I followed the recipe exactly, using gluten-free Banza Chickpea Rotini + jarred roasted red peppers. I added some steamed broccoli rabe because I was craving greens. Would be great plain or with broccolini, broccoli or even mushrooms. I read afterwards that Samantha Eason topped hers with vegan pesto and that would have been a yummy add!